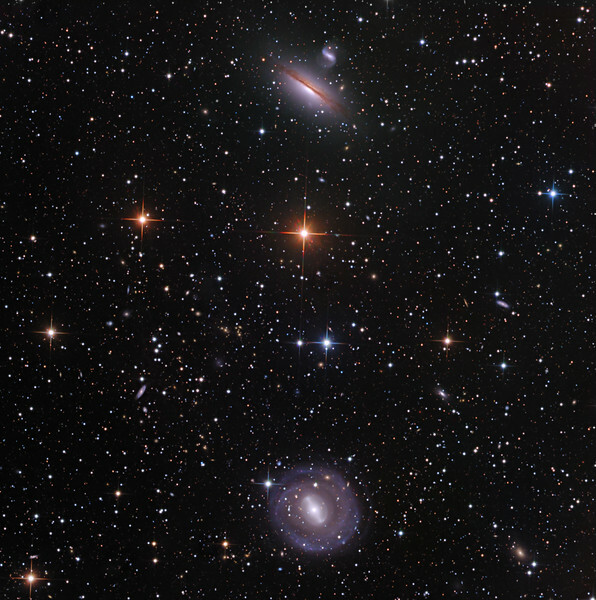 NGC 5101 and 5078 in southern Hydra, and literally hundreds of distant friends. There is a nice cluster of distant orange galaxies about 20% of the way toward 8 o'clock from centre. 5101 is a delicate face-on spiral. 5078 is an edge-on spiral with branching dust lanes across the more orange centre, and interacting with a companion. Lum 7 hrs in 1hr subs. RGB 2.5hrs each in 30 min subs. Aspen CG16M on 20" PlaneWave. As always, all processing using our own in-house software, GoodLook 64.